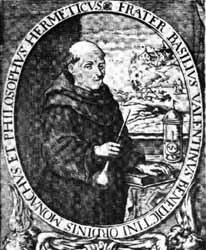 Records of the life of Basilius Valentinus, the Benedictine monk who for his achievements in the chemical sphere has been given the title of Father of Modern Chemistry, are a mass of conflicting evidence. Many and varied are the accounts of his life, and historians seem quite unable to agree as to his exact identity, or even as to the century in which he lived. It is generally believed, however, that 1394 was the year of his birth, and that he did actually join the Benedictine Brotherhood, eventually becoming Canon of the Priory of St. Peter at Erfurt, near Strasburg, although even these facts cannot be proved. Whatever his identity, Basil Valentine was undoubtedly a great chemist, and the originator of many chemical preparations of the first importance. Amongst these are the preparation of spirit of salt, or hydrochloric acid from marine salt and oil of vitriol (sulphuric acid) the extraction of copper from its pyrites (sulphur) by transforming it firstly into copper sulphate, and then plunging a bar of iron in the watery dissolution of this product: the method of producing sulpho-ether by the distillation of a mixture of spirit of wine and oil of vitriol: the method of obtaining brandy by the distillation of wine and beer, rectifying the distillation on carbonate of potassium. In his writings he has placed on record many valuable facts, and whether Basil Valentine is the correct name of the author or an assumed one matters little, since it detracts nothing from the value of his works, or the calibre of his practical experiments. From his writings one gathers that he was indeed a monk, and also the possessor of a mind and understanding superior to that of the average thinker of his day. The ultimate intent and aim of his studies was undoubtedly to prove that perfect health in the human body is attainable, and that the perfection of all metallic substance is also possible. He believed that the physician should regard his calling in the nature of a sacred trust, and was appalled by the ignorance of the medical faculty of the day whose members pursued their appointed way in smug complacency, showing little concern for the fate of their patients once they had prescribed their pet panacea. On the subject of the perfection of metallic bodies, as in his reference to the Spagyric Art, the Grand Magi-strum, the Universal Medicine, the Tinctures to transmute metals and other mysteries of the alchemist's art, he has completely mystified not only the lay reader, but the learned chemists of his own and later times. In all his works the important key to a laboratory process is apparently omitted. Actually, however, such a key is invariably to be found in some other part of the writings, probably in the midst of one of the mysterious theological discourses which he was wont to insert among his practical instructions, so that it is only by intensive study that the mystery can be unravelled. His most famous work is his Currus Triumphalis Antimonii - The Triumphal Chariot of Antimony. A perusal of this book makes it quite evident that Valentine had investigated very thoroughly the properties of antimony, and the findings on his experimental work with this metal have.been brought forward as recent discoveris by chemists of our day. His other works are The Twelve Keys - The Medicine of Metals - Of Things Natural and Supernatural - Of the First Tincture, Root and Spirit of Metals - and his Last Will and Testament. It is alleged that this last work remained concealed for a number of years within the High Altar of the church belonging to the Priory. Such a story is quite feasible, since alchemists both before and after this era, deeming their works unfit for the age in which they were written, are known to have buried or otherwise secreted their writings for the discovery and benefit, as they doubtless hoped, of a more deserving and more enlightened age. Such manuscripts would very often not be discovered for several generations after the death of the author. In view of his other outstanding achievements as a chemist of great ability, it seems not illogical to suppose that Valentine's Universal Method of Medicine should be capable of achieving as great a measure of success as his other somewhat more prosaic discoveries. Most Ancient Stone and unseal the Most Secret Fountain of Health. A painter can set yellow upon white, and red or crimson upon yellow; for, though all these colours are present, yet the latter prevails on account of its greater intensity. When you have accomplished the same thing in our Art, you have before your eyes the light of wisdom, which shines in the darkness, although it does not burn. For our sulphur does not burn, but nevertheless its brilliancy is seen far and near. Nor does it colour anything until it has been prepared, and dyed with its own colour, which it then imparts to all weak and imperfect metals. This sulphur, however, cannot impart this colour until it have first by persevering labour been prevailed upon to abjure its original colour. For the weaker does not overcome the stronger, but has to yield the victory to it. The gist of the whole matter lies in the fact that the small and weak cannot aid that which is itself small and weak, and a combustible substance cannot shield another substance from combustion. That which is to protect another substance against combustion must itself be safe from danger. The latter must be stronger than the former, that is to say, it must itself be essentially incombustible. He, then, who would prepare the incombustible sulphur of the Sages, must look for our sulphur in a substance in which it is incombustible -- which can only be after its body has been absorbed by the salt sea, and again rejected by it. Then it must be so exalted as to shine more brightly than all the stars of heaven, and in its essence it must have an abundance of blood, like the Pelican, which wounds its own breast, and, without any diminution of its strength, nourishes and rears up many young ones with its blood. This Tincture is the Rose of our Masters, of purple hue, called also the red blood of the Dragon, or the purple cloak many times folded with which the Queen of Salvation is covered, and by which all metals are regenerated in colour. If a merchant would keep a clear conscience, let him give just measure to his neighbor. If his measure and weight be not short, he will receive praise from the poor. The same moderate course must be adopted in the fiery regimen of our Magistery. For it is all important that the liquid should not be dried up too quickly, and that the earth of the Sages should not be melted and dissolved too soon, otherwise your fishes would be changed into scorpions. If you would perform our task rightly, take the spiritual water, in which the spirit was from the beginning, and preserve it in a closely shut chamber. For the heavenly city is about to be besieged by earthly foes. You must, therefore, strongly fortify it with three impassable and well-guarded walls, and let the one entrance be well protected. Then light the lamp of wisdom and seek with it the gross thing that was lost, shewing only such light as is needed. For you must know that the worms and reptiles dwell in the cold and humid earth, while man has his proper habitation upon the face of the earth; the bodies of angels, on the other hand, not being alloyed with sin or impurity, are injured by no extreme either of heat or cold. When man shall have been glorified, his body will become like the angelic body in this respect. If we carefully cultivate the life of our souls, we shall be sons and heirs of God, and shall be able to do that which now seems impossible. But this can be effected only by the drying up of all water, and the purging of heaven and earth and all men with fire. Neither human nor animal bodies can be multiplied or propagated without decomposition; the grain and all vegetable seed, when cast into the ground, must decay before it can spring up again; moreover, putrefaction imparts life to many worms and other animalculae. The process of augmentation and quickening is mostly performed in the earth, while it is caused by spiritual seed through the other elements. The same thing may be observed in regard to vegetable life. Nettles and other weeds spring up where no such seed has ever been sown. This occurs only by putrefaction. The reason is that the soil in such places is so disposed, and, as it were, impregnated, that it produces these fruits, which is a result of the properties of sidereal influence; consequently the seed is spiritually produced in the earth, and putrefies in the earth, and by the operation of the elements generates corporeal matter according to the species of Nature. Thus the stars and the elements may generate new spiritual, and, ultimately, new vegetable seed, by means of putrefaction. But man cannot create new seed; for it is not in his power to order the operation of the elements and the essential influences of the stars. By natural conditions, however, new plants are generated simply through putrefaction. This fact is not noticed by the farmer, simply because it is a thing that he has always been used to, and for which he is unable to find an explanation. But you who should know more than the vulgar herd, must search into the causes of things, and endeavor to understand how the process of generation and resuscitation is accomplished by means of decomposition, and how all life is produced out of decay. When water is distilled, air and fire issue from it, and the water and material earth remain at the bottom. Again, when the invisible part of elementary fire is extracted, you get water and earth by themselves. Nor can any of the three other elements exist without air. It is air that gives to earth its power of production, to fire its power of burning, to water its power of generating fruit. Again, air can consume nothing, nor dry up any moisture, without that natural heat which must be imparted to it by fire. For everything that is hot and dry contains fire. From these considerations we conclude that no element can exist without the others, and that in the generation of all things there is a mingling of the four elements. He who states the contrary in no wise understands the secrets of Nature, nor has he investigated the properties of the elements. For if anything is to be generated by putrefaction, the process must be as follows: The earth is first decomposed by the moisture which it contains; for without moisture, or water, there can be no true decay; thereupon the decomposed substance is kindled and quickened by the natural heat of fire: for without natural heat no generation can take place. Again, if that which has received the spark of life, is to be stirred up to motion and growth, it must be acted upon by air. For without air, the quickened substance would be choked and stifled in the germ. Hence it manifestly appears that no one element can work effectually without the aid of the others, and that all must contribute towards the generation of anything. Thus their quickening cooperation takes the form of putrefaction, without which there can be neither generation, life, nor growth. That there can be no perfect generation or resuscitation without the co-operation of the four elements, you may see from the fact that when Adam had been formed by the Creator out of earth, there was no life in him, until God breathed into him a living spirit. Then the earth was quickened into motion. In the earth was the salt that is, the Body; the air that was breathed into it was mercury or the Spirit, and this air imparted to him a genuine and temperate heat, which was sulphur, or fire. Then Adam moved and by his power of motion, shewed that there had been infused into him a life-giving spirit. For as there is no fire without air so neither is there any air without fire. Water was incorporated with the earth Thus living man is an harmonious mixture of the four elements; and Adam was generated out of earth, water, air, and fire, out of soul, spirit, and body, out of mercury, sulphur, and salt. Observe that this seed contains a living volatile spirit. For when it is distilled, there issues from it first a spirit, and then that which is less volatile. But when by continued gentle heat, it is reduced to an acid, the spirit is not so volatile as it was before. For in the distillation of the acid the water issues first, and then the spirit. And though the substance remains the same, its properties have become very different. It is no longer wine, but has been transmuted by the putrefaction of gentle heat into an acid. That which is extracted with wine or its spirit, has widely different properties and powers from that which is extracted with an acid. For if the crystal of antimony be extracted with wine or the spirit of wine, it causes vomiting and diarrhea, because it is a poison, and its poisonous quality is not destroyed by the wine. But if it be extracted with a good distilled acid, it furnishes a beautiful extract of a rich color. If the acid be removed by means of the St. Mary's Bath, and the residuum of yellow powder washed away, you obtain a sweet powder which causes no diarrhea, but is justly regarded as a marvellously beneficial medicine. Saturn, who is called the greatest of the planets, is the least useful in our Magistry. Nevertheless, it is the chief Key of the whole Art, howbeit set in the lowest and meanest place. Although by its swift flight it has risen to the loftiest height, far above all other luminaries, its feathers must be clipped, and itself brought down to the lowest place, from whence it may once more be raised by putrefaction, and the quickening caused by putrefaction, by which the black is changed to white, and the white to red, until the glorious color of the triumphant King has been attained. Therefore, I say that though Saturn may seem the vilest thing in the world, yet it has such power and efficacy that if its precious essence, which is excessively cold, be reduced to a metallic body by being deprived of its volatility, it becomes as corporeal as, but far more fixed than, Saturn itself. This transmutation is begun, continued, and completed with Mercury, sulphur, and salt. This will seem unintelligible to many, and it certainly does make an extraordinary demand upon the mental faculties; but that must be so because the substance is within the reach of everyone, and there is no other way of keeping up the divinely ordained difference between rich and poor. In the preparation of Saturn there appears a great variety of different colors; and you must expect to observe successively black, grey, white, yellow, red, and all the different intermediate shades. In the same way, the Matter of all the Sages passes through the several varieties of colour, and may be said to change its appearance as often as a new gate of entrance is opened to the fire. Jupiter is the Grand Marshal, and is preceded by a banner of grey color, borne by Rhetoric, and adorned with a variegated representation of Hope. Mars is at the head of military affairs, and executes his office with a certain fiery ardour. Geometry carries before him a crimson banner, on which you may behold Courage in a crimson cloak. Mercury holds the office of Chancellor; Arithmetic is his standard bearer, and his standard is of many colours; on it may be observed the figure of Temperance in a many coloured robe. In our Stone, as composed by me and by those who have long preceded me, are contained all elements, all mineral and metallic forms, and all the qualities and properties of the whole world. In it we find most powerful natural heat, by which the icy body of Saturn is gently transmuted into the best gold. It contains also a high degree of cold, which tempers the fervent heat of Venus, and coagulates the mercury, which is thereby also changed into the finest gold. All these properties slumber in the substance of our Stone, and are developed, perfected, and matured by the gentle connection of natural fire, until they have attained their highest perfection. If the fruit of a tree be plucked before it is ripe, it is unfit for use; and if the potter fail to harden his vessels in the fire, they cannot be employed for any good purpose. The substance is dissolved in a bath, and its parts reunited by putrefaction. In ashes it blossoms. In the form of sand all its excessive moisture is dried up. Maturity and fixity are obtained by living fire. The work does not actually take place in the Bath of St. Mary, in horse- dung, in ashes, or in sand, but the grades and regimen of the fire proceed after the degrees which are represented by these The Stone is prepared in an empty furnace, with a threefold line of circumvallation, in a tightly closed chamber. It is subjected to continued connection, till all moisture and clouds are driven off, and the King attains to indestructible fixedness, and is no longer liable to any danger or injury, because he has become unconquerable. Let me express my meaning in a somewhat different manner. When you have dissolved your earth with your water, dry up the water with its own inward fire. Then the air will breathe new life into the body, and you will have that which can only be regarded as that Great Stone which in a spiritual manner pervades human and metallic bodies, and is the universal and immaculate Medicine, since it drives out that which is bad, and preserves that which is good, and is the unfailing corrective of all imperfect or diseased substances. This Tincture Is of a color intermediate between red and purple, with something of a granite hue, and its specific weight is very considerable. One night, when he was buried in a deep sleep, there came to him a certain winged messenger, named Phoebus, who touched his feet, which were very hot, and said: " Thou noble knight, since thou hast wandered through many cities and kingdoms, and suffered many things at sea, in battle, and in the lists, the heavenly Father has bidden me make known to thee the following means of obtaining thy prayer: Take blood from thy right side, and from the left side of thy spouse. For this blood is the heart's blood of your parents, and though it may seem to be of two kinds, vet, in reality, it is only one. Mix the two kinds of blood, and keep the mixture tightly enclosed in the globe of the seven wise Masters There that which is generated will be nourished with its own flesh and blood, and will complete its course of development when the Moon has changed for the eighth time If thou repeat this process again and again, thou shalt see children's children, and the offspring of thy body shall fill the world." Seek for that Stone which has no fleshly nature, but out of which a volatile fire is extracted, whence also this stone is made, being composed of white and red. It is a stone, and no stone; therein Nature alone operates. A fountain flows from it. The fixed part submerges its father, absorbing it, body and life, until the soul is returned to it. And the volatile mother like to him, is produced in her own kingdom; and he by his virtue and power receives greater strength. The volatile mother when prepared surpasses the sun in summer. Thus the father by means of Vulcan was produced from the spirit. Body, soul, and spirit exist in both, whence the whole matter proceeds. It proceeds from one, and is one matter. Bind together the fixed and the volatile; they are two, and three, and yet one only. If you do not understand you will attain nothing. Adam was in a bath -- wherein Venus found her like, which bath the aged Dragon had prepared when his strength was deserting him. There is nothing, says the Philosopher, save a double mercury; I say that no other matter has been named; blessed is he who understands it. Seek therein, and be not weary; the result justifies the labour. There are many who will consider that I am speaking too openly, and will hold me answerable for the wickedness that they think will follow, but let them rest assured that it will be sufficiently difficult, notwithstanding, for any thick-headed persons to find what they seek herein. At the same time the matter shall be made clear to the elect. Hearken then, thou follower of truth, to these my words, and so shalt thou find the true way. In the first place, you must know that no ordinary quicksilver is useful, but our quicksilver is produced from the best metal by the spagyric art, pure, subtle, clear, and glistening, like a spring, pellucid even as crystal, free from all dross. Hence make water or combustible oil. For Mercury was in the beginning water, and herein all the Sages agree with my dictum and teaching In this oil of Mercury dissolve its own Mercury, from which the water in question was made, and precipitate the Mercury with its own oil. Then we have a twofold mercurial substance; but you must know that gold must first be dissolved in a certain water, as explained in my second Key, after the purification described in the first Key, and must be reduced into a subtle calx, as is mentioned in the fourth Key. Next, this calx must be sublimated by the spirit of salt, again precipitated, and by reverberation reduced into a subtle powder. Then its own sulphur can more easily enter into its substance, and have great friendship with the same, for they have a wondrous love towards each other. Thus you have two substances in one, and it is called Mercury of the Sages, but is yet a single substance, which is the first ferment.